Michael Brambley manages the Building Systems Program at Pacific Northwest National Laboratory (PNNL), where his work focuses on developing and deploying technology to increase the energy efficiency of buildings and other energy using systems. His primary research thrusts in recent years have been in development and application of automated fault detection and diagnostics and wireless sensing and control. He has been with PNNL for 17 years before which he was an Assistant Professor in the Engineering School at Washington University in St. Louis. He holds M.S. (1978) and Ph.D. (1981) degrees from the University of California, San Diego, and the B.S. (1976) from the University of Pennsylvania, and is the author of more than 60 technical publications and numerous research project reports. He is an active member of the American Society of Heating, Refrigerating, and Air-Conditioning Engineers (ASHRAE) for which he has served on technical committees for Computer Applications and Smart Building Systems. Michael has been the organizer of numerous seminars and symposia at ASHRAE’s semi-annual meetings and is a member of ASHRAE’s Program Committee. In addition to several other professional organizations, Michael is a member of the Instrumentation, Systems, and Automation Society (ISA) and Sigma Xi, The Scientific Research Society. Srinivas Katipamula received his M.S. and Ph.D. in Mechanical Engineering in 1985 and 1989, respectively, from Texas A&M University. He has been working as a Sr. Research Scientist at Pacific Northwest National Laboratory (PNNL), in Richland, WA, since January 2002. For two years (2000 through 2001) he managed the Analytics Group at the Enron Energy Services (EES). Before joining EES, he worked at PNNL for 6 years and prior to that he worked for the Energy Systems Lab at the Texas A&M University from 1989 to 1994. He has authored or co-authored over 60 technical publications, over 40 research reports, and made several presentations at national and international conferences. He is an active member of both American Society of Heating, Refrigeration, and Air Conditioning Engineers and the American Society of Mechanical Engineers. How is commissioning likely to be performed 20 or 30 years from now? Will technology advance to the state where building systems and equipment are automatically commissioned on an on-going basis as conditions demand? The authors of this article believe it will and that the technologies that appear on the pages of Automated Buildings every month—wireless communication, automated diagnostics, advanced controls—are the seeds for the technology that will provide these capabilities. This article takes a brief look at the benefits of commissioning and describes a vision of the future where most of the objectives of commissioning will be accomplished automatically by capabilities built into the building systems themselves. Commissioning will become an activity that’s performed continuously rather than periodically, and only repairs requiring replacement or overhaul of equipment will require manual intervention. The article then identifies some of the technologies that will be needed to realize this vision and ends with a call for all involved in the enterprise of building commissioning and automation to embrace and dedicate themselves to a future of automated commissioning. missing, failed and uncalibrated sensors. Energy savings are more difficult to establish for new construction, but by using building simulation, the savings associated with commissioning can be estimated. A recently published meta-analysis (Mills et al. 2004) found median cost savings on energy of 15% and payback periods of 0.7 years for retro-commissioning of existing buildings. For commissioning of new buildings, the study found a median payback period of 4.8 years. While these savings are impressive, penetration of commissioning3 in the buildings market remains small. A recent report (Quantum Consulting 2003, pp. 1-3) on commissioning in public buildings states “While the concept of commissioning is increasingly accepted, there are still barriers--particularly with regard to cost--to implementation of the kind of thorough, independent third-party commissioning that is necessary for the full benefits of commissioning to be realized.” Only a small fraction of new construction and a very small fraction of existing buildings have been commissioned. Even when performed, pressures exist to keep costs down, which in some cases limits the thoroughness to which the commissioning is performed. The two factors that likely play the most significant roles in limiting the widespread adoption of commissioning and retro-commissioning are: 1) lack of knowledge of the benefits of commissioning by key decision makers and 2) the cost of commissioning. This paper focuses on how the costs of commissioning could be lowered substantially by automating the commissioning processes. Fortunately, reducing cost also reduces barriers in decision making, making acceptance by decision makers easier even in the absence of information. Changes to how commissioning is executed that reduce its cost and make it a routine part of how building systems are designed, installed, and operated could in the long run better promote the objectives of commissioning than keeping it a distinct practice. Key to this is reducing the labor intensity of commissioning by automating as many of the processes involved as possible. Compared to the cost of labor, automation technology is inexpensive. Commissioning provides important benefits to both new and existing buildings, but there may be a better way to achieve these benefits. In the long-term future (say 20 or 30 years from now), most (but not all) of the objectives of commissioning could be provided using automated processes, reducing many of the barriers that exist today for commissioning and impacting a much larger portion of the building stock. Furthermore, doing so could increase consistency in the commissioning process, improve the reliability of building systems, and make the process of assessing performance, which is a critical part of retro-commissioning, a truly continuous process. How might this be done? First, identify processes that produce the desired outcomes that could be done automatically. Then develop building equipment, systems, control systems, and tools that implement these processes automatically. Gaps between the automated processes could be filled by manual procedures, ensuring that the activities that absolutely require human intervention and tie the automated processes together are executed efficiently and cost effectively. In the next two sections, we first provide a vision for commissioning in the distant future after the automated processes are fully developed and implemented, then take a critical look at commissioning to identify the processes that require direct human involvement and processes that do not and could be automated. We then identify technologies that are key to realizing the automated processes and conclude by identifying research and development that will be essential to accomplishing our vision for commissioning of the future. In doing this, we are not suggesting that commissioning and efforts to promote it be suddenly terminated today. On the contrary, we believe that commissioning as conducted today is important as a transition process. It provides important benefits, but as with most things, it needs improvement over time. Our vision is for the long term. It will not be realized tomorrow, but the vision can help guide R&D and product development decisions so they lead us to a future where the benefits of commissioning permeate the entire building enterprise. Likewise, as this technology and tools embodying it emerge, commissioning should adapt and change to assimilate these new capabilities, making the commissioning process faster, less expensive, more thorough, more consistent, more reliable, more cost effective, more continuous, and appealing to more of the market. When operation of a new building or new piece of equipment or system is started in the future, with the push of a “start” button, equipment and systems should all test themselves, identify any installation or configuration problems, automatically fix problems amenable to “soft” solutions, and report the need for “hard” solutions requiring replacement or installation of hardware. A report on the performance of all building systems and equipment should be automatically generated, delivered to key recipients, and stored electronically for future reference and updating. During initial operation (e.g., for the first year) and continuing over its lifetime, the system should optimize itself, integrating its behavior with external constraints, such as occupancy, occupant behavior and feedback, energy prices, demand charges, and weather. Although most of the optimization should take place during this initial period of say a year, the building systems should continue to optimize themselves as prices change, spaces are converted to different uses, tenants change, and building equipment itself ages and wears. Using prognostics, systems should automatically inform building staff regarding expected lives and recommended service times for equipment. Diagnostics should detect degradation and failure, make “soft” fixes when possible (alerting building staff to changes made and electronically documenting changes automatically made for future reference) and alert staff to performance degradation, impending failures and required maintenance to prevent them. Realization of this vision will present unique technological challenges, but methods under development (some examples of which are provided in the next section) are addressing these differences. Technology will evolve over time and change the practice of commissioning, bringing benefits to building owners and occupants. Ours is a vision for buildings of the future that automatically will perform many of the actions required to meet the objectives of commissioning, where technology will provide the cornerstone for achieving this future. What Parts of Commissioning Could be Automated? The major tasks composing commissioning of new buildings and retro-commissioning of existing buildings are shown in Table 1 by phase of the project. Some processes are critical to accomplishing the objectives of commissioning. Other processes exist to support commissioning specifically as it is performed today. If the overall process of commissioning were changed, some of these processes might become unnecessary or would be modified considerably. The same overall objectives might be achieved without an identical set of processes. Table 1 includes designations of whether activities would be manual (M) or automated (A) in a highly automated future for commissioning. Commissioning objectives would be established largely by standards and specialized to specific projects by detailed objectives being automatically inherited by associating objectives with generic types of commissioning projects. For retro-commissioning, most activities would become a routine part of building operation and maintenance and might not require explicit development of objectives. Similarly, objectives associated with equipment startup would be unneeded because all equipment would be automatically started up and tested with standard automated start-up routines satisfying standard objectives. Commissioning plans similarly would be specified automatically based on information automatically obtained from design documents and only limited information would be input manually (e.g., special constraints on schedules). Design information would be automatically stored as developed and shared throughout the life of the building. This would include objectives and intent behind the design. Automatic storage and universal data sharing protocols would eliminate the need to manually take off information from drawings or re-input information developed in earlier phases. Ultimately, even existing buildings that were designed before automated data storage was routinely used, will possess systems that will automatically detect all aspects of the buildings, systems and equipment installed, generate the equivalent design, and evaluate it. Designs will be automatically evaluated with respect to meeting design intents as well as energy and other standards. For many years, researchers have studied the design process and developed methods for automating both design generation and evaluation. A sampling of issues and advancements in design automation can be found in Gero 2002, Gero 2000, Caldas and Norford 2002, Iliescu et al. 2000, Fleming and Waterbury 1995, and Fleming and Aygen 2001. Research in these fields will provide the basis for automation of design review and revision performed as part of commissioning. To the extent that commissioning specifications are still required in bid documents far in the future, most of the required language might be generated automatically, reviewed manually, and revised manually in special cases where required. Eventually, though, all documents will be reviewed automatically. Computer-based tools will parse text and “interpret” the meaning, and evaluate it with respect to needs and design criteria. Given information about the equipment and systems in a building or specified by the design, checklists (to the extent still needed) could be generated automatically. With some exceptions, most checklists would be eliminated because checks would be performed automatically. Lists might remain only as an organizational form for presenting results to human users. Just-in-time facility documentation (Song et al. 2002) may become the basis for operation and even parts of commissioning and retro-commissioning. Even proper installation of equipment (e.g., whether any fans are installed backwards) could initially be checked automatically. Some problems might require visual inspection after initial automatic detection of problems, but the labor for this would be highly targeted to problem situations. All testing, data collection, analysis, and interpretation of results would be performed automatically. Examples of how some tests could be executed automatically today are given by Katipamula et al. 2003, PECI and Battelle 2003, and Brambley and Katipamula 2003. These capabilities are based on research and development in the fields of automated fault detection, diagnostics and prognostics.4 “Fixing deficiencies” and “implementing repairs and improvements” are designated in Table 1 as being done manually; however, only repairs and improvements requiring physical repair, replacement, or reinstallation require human intervention. As shown in PECI and Battelle 2003 and Katipamula et al. 2003, some repairs such as revising control code, changing set points, and recalibrating sensors might be done automatically with no human intervention except to read a short report from the computerized system regarding actions it took. Automatically retuning of control algorithms is also possible today for some applications and most tuning will be done automatically in the long-term future. As indicated in Table 1, most commissioning activities will be done automatically at some time in the future. People will still need to coordinate the processes and ensure that reporting to owners and management is appropriate, but many of the commissioning activities executed manually today will become automatic. This transformation will reduce the labor, time, and cost of commissioning and help overcome some of the key barriers that widespread application of commissioning faces today. Reaching that future, however, will require advances in key enabling technologies and then application of them to building systems. Table 2 provides a list of key technologies needed to achieve this future and the capabilities for commissioning that each might provide. Wireless data communication will eliminate many of the wires required today to collect data or transmit control signals to device actuators. Wires can represent a significant fraction of the cost of a sensor or control point. As a result, wireless communication for sensors and controls will enable more ubiquitous use of sensing, increasing information on the operating state of systems and equipment available at any point in time and enabling better control and maintenance. Plug and play controls and equipment will enable quicker installation and set up of physical systems and controls. Controls will ultimately become self-writing, given some input on the performance objectives for the building and equipment characteristics. Small, embedded, networked processors will distribute control to a greater degree than today’s control systems, leading to better, higher resolution, system response while coordinating through networking with other subsystems and components to achieve building-level objectives. 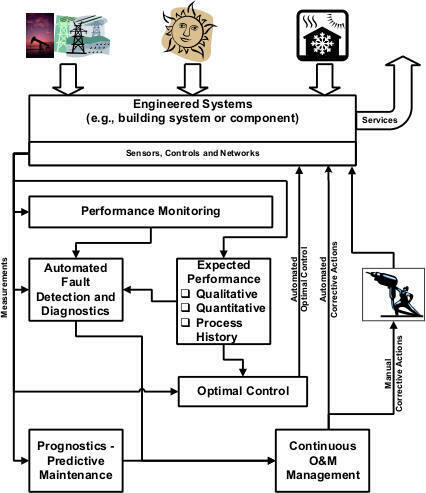 Automated fault detection and diagnostics will lead to greater awareness of system conditions throughout buildings on a continuous basis (see Figure 1). Corrective actions will be enacted automatically by “aware” agents capable of correcting faults in some cases (e.g., correcting a control schedule or fixing an incorrect set point). In cases where automatic fault correction is not possible, notifications will be provided to building staff and management regarding faults and their costs. No longer will faults go unrecognized or will an engineer need to study data patterns to detect them. The operating state of building systems will be known along with the performance and cost impacts of problems so priorities for operation and maintenance can be made with complete information. Prognostic techniques will automatically predict the remaining serviceable life of equipment and suggest condition-based maintenance actions. Automated proactive testing will be the basis for short-term functional testing. These tests allow a wide range of conditions to be simulated over a relatively short period of time so that problems can be detected faster than if only passive observation of routine operation is used. Proactive testing will enable consistent performance of functional tests automatically during initial commissioning and then at regular periods throughout the life of the building. Fault detection and diagnostic methods will have applications in design review in addition to use on physical components. Diagnosis of design is similar to diagnosis of a physical device. First a problem or fault is detected with the design. Evaluation of the design indicates that it does not satisfy some design criterion (requirement). This is analogous to fault detection. Then the reason for the fault existing (its cause) is identified or isolated, which is analogous to fault diagnosis or isolation. The design then needs to be revised to correct the deficiency, which parallels fault correction. When this entire process is automated, it will provide continuous review and evaluation of designs as they evolve. This will likely be done by automated agents (processes whose purpose is to execute part of the design review and report the results), each of which is responsible for evaluation with respect to a small subdomain. Some of these agents will specifically handle evaluations from the perspectives of commissioning. Data exchange protocols will provide the basis for sharing data among automated agents as well as commissioning professionals, operating staff, and facility management. Radio frequency identification tags will also play a role in tracking assets as well as enabling easy, automatic identification of each piece of equipment and component, enabling automatic checking for consistency with specifications as equipment arrives on the construction site, and assessing its installation. Tags may also provide physical and performance characteristics from manufacturer tests, which then will become available to processes that evaluate the correctness of installation, develop control algorithms, evaluate functional test results, and monitor performance. Geographic information systems (GIS) as well as localization algorithms using wireless communications information (see, for example, Savvides et al. 2004) will be used to determine locations of equipment. Together these technologies will enable realization of highly automated commissioning and operation. Figure 1. Advanced automated retro-commissioning process. The impediments to realizing a future where building commissioning and retro-commissioning are largely automated are both technological, social and institutional. Without the technology, however, the vision is not possible. With it, automated capabilities for executing all but the management, repair, and replacement activities of retro-commissioning could be delivered as parts of equipment packages and control systems. With the addition of design tools, this could be extended to commissioning of new buildings. Advances in each of the technologies identified in Table 2 will be needed. Because the buildings industries are highly fragmented, public R&D organizations will need to provide leadership to produce this technology. Even then, a market demand will need to develop to drive the creation of new equipment and control systems with automated commissioning capabilities. The building commissioning industry will evolve, gaining market share over time as energy and electric power prices increase and more burden for management of the electric power grid is pushed to end users (see, for example, http://gridwise.pnl.gov/ for a vision of the future electric power grid in which “customers” play an active role). Penetrating the market will require improved cost effectiveness for commissioning, as well as education of building owners and operators regarding the benefits of commissioning. Commissioning will need to change in ways that reduce cost while preserving or even enhancing the returns on it. The practice of commissioning will likely change gradually over time with the introduction of new tools that automate parts of the process. Market transformation programs at the federal, regional, state and local levels can help spread the application of commissioning for the public good. Research, development, deployment and market transformation programs will be needed to accelerate the introduction of automated capabilities and the spread of commissioning, improving the performance of the building stock and bringing energy and environmental benefits. Still, the willingness of the commissioning profession to accept and embrace these technologies will be critical to determining their rate of penetration. Resistance won’t stop the introduction of the technologies, only delay their application, but earlier acceptance will help accelerate capture of the benefits associated with high-quality, widespread commissioning even if the mechanism of delivery changes. Automation could change the nature of the commissioning process for both new and existing buildings. The services performed today as part of commissioning of existing buildings should become part of routine operation and maintenance with automated monitoring, testing, and diagnosis continually performed by the building systems and equipment themselves, taking much of the responsibility off humans. Still, repairs and replacement of hardware will continue to require human intervention. Deteriorating bearings in pumps, failed windings in fan motors, and leaking valves will need humans to repair or replace them. Automation can only prompt repair technicians to take action to make repairs. Likewise, equipment found to be installed incorrectly during construction (e.g., a fan installed backwards) would require human involvement to remove and reinstall it properly. For the commissioning cycle to be complete, humans will still need to respond to information provided automatically. The services provided by commissioning during design and construction should become integral parts of those phases of the building life cycle. Assurance of their proper consideration during these phases of building projects may still require an advocate, like the commissioning agent today, but ideally these responsibilities will be taken over by other members of design and construction teams. In any case, the provider of these services is likely to focus on design and construction, rather than responsibilities over the entire building life cycle. System start up, like commissioning responsibilities during operation, is likely to become increasingly automated. Equipment and systems should become self-configuring, self-testing, and self-verifying. Even proper installation is likely to be automatically verified. Once again, though, when equipment and system components are found to be installed incorrectly, human technicians will still need to take responsibility to repair the installation. Equipment though may become intolerant to problems it detects (fail safe), refusing to start up until all problems it detects with the installation are corrected. Automation will likely change the role of commissioning over time and in 20 or 30 years, its objectives may be met completely differently than they are today. These changes will not occur overnight but rather over many years, but they should lead to more cost effective delivery of the outcomes promoted by commissioning to a much broader segment of the commercial buildings market. Change is inevitable and will bring benefits. As with use of automation in design, detractors will find problems with greater use of automation in commissioning; proponents will grasp increased automation as an opportunity (Chastain 2002). The authors recommend that the building commissioning community embrace the opportunities posed by new technology and employ them to deliver better services. Research and development will be required to achieve the benefits of greater automation in commissioning but so will adoption by the various players in the commissioning and broader buildings communities. Researchers and providers of services alike have the opportunity to transform the delivery of commissioning’s objectives by working in concert to pursue a vision in which those objectives are delivered faster, less expensively, more thoroughly, more consistently, more reliably, more cost effectively, and more continuously, to a broader market through automation. Proceedings of the 2004 ACEEE Summer Study on Energy Efficiency in Buildings. Washington, DC: American Council for an Energy Efficient Economy. In Proceedings of the 11th National Conference on Building Commissioning, May 20-22, 2003. Portland, Ore.: Portland Energy Conservation Inc.
Chastain, T., Y. E. Kalay and C. Peri. 2002. “Square Peg in a Round Hole or Horseless Carriage? Reflections on the Use of Computing in Architecture.” Automation in Construction 11(2):237-248. Claridge, David E, Charles H. Culp, Mengsheng Liu, S. Deng, Wayne D. Turner, and Jeffery S. Haberl. 2000. ACEEE Summer Study. Washington, D.C.: American Council for an Energy Efficient Economy. Overview.” Journal of Architectural Engineering 1(4):147-152. HVAC Systems. LBNL 48629. Berkeley, Ca. : Lawrence Berkeley National Laboratory. H. Li, Q. Shen, D. Scott and P. Love (eds. ), pp. 16-24. Hung Hom, Kowloon, Hong Kong: HKPU Press. M. Anson, J. Ko and E. Lam (eds. ), pp. 47-54. Amsterdam: Elsevier. Energy Conservation Inc. and Oak Ridge, Tenn.: Oak Ridge National Laboratory. for Building Envelope Design.” In INCITE 2000, H. Li, Q. Shen, D. Scott and P. Love (eds. ), pp. 697-713. Hung Hom, Kowloon, Hong Kong: HKPU Press. Ventilating, Air-Conditioning and Refrigerating Research. Katipamula, S., M. R. Brambley, and L. Luskay. 2003. "Automated Proactive Techniques for Commissioning Air-Handling Units." Washington, D.C.: Federal Energy Management Program, U.S. Department of Energy. Available on the worldwide web at: http://www.eere.energy.gov/femp/pdfs/ccg01_covers.pdf. Mills, E., H. Friedman, T. Powell, N. Bourassa, D. Claridge, T. Haasl, and M. A. Piette. 2004. New Construction in the United States. LBNL-56637. Berkeley, Calif.: Lawrence Berkeley National Laboratory. Institute, Washington, D.C. Available online: www.arti-21cr.org/research/completed/finalreports/30040-final.pdf. Quantum Consulting. 2003. Market Progress Evaluation Report--Commissioning In Public Buildings Project, No. 3. Report #E03-107. Portland, Ore.: Northwest Energy Efficiency Alliance. C. S. Raghavendra, K. M. Sivalingam and T. Znati (eds. ), pp. 327-349. Boston, Mass. : Kluwer Academic Publishers. Using Web Technology.” Automation in Construction 11(2):185-197. U.S. DOE. Undated. Building Commissioning – The Key to Quality Assurance. Washington, D.C.: U.S. Department of Energy, Rebuild America Program. An earlier version of this paper was presented at the 2004 ACEEE Summer Study on the Energy Efficiency of Buildings and is published in the proceedings of that conference (Brambley and Katipamula 2004). Operated by Battelle Memorial Institute for the U.S. Department of Energy. Throughout this paper, the authors use the term “commissioning” to represent generically all forms of the process applied to both new buildings during design and construction and existing buildings already in operation, as well as the specific process for new construction. The context establishes which use is intended. A comprehensive review of fault detection, diagnostic, and prognostic methods can be found in Katipamula and Brambley 2005, and a recent review of tools using such methods is provided by Friedman and Piette 2001 (http://www.peci.org/library/PECI_DxToolsGuide1_1002.pdf). A Wake-Up Call and a Brainer Ask any economist worth his salt what the total impact on American industry would be if our gross use of energy were to decrease by 15% over the next 10 years. Waking Up to Wireless Wireless…. WAKE UP it is here and it is now! Autonomic Wireless Building Networks The key to reliable ad hoc wireless networking for building automation applications and protocols is an Autonomic mesh network: an Autonomic network is one that self-configures, self-heals, self-regulates, and understands when to apply these parameters. "IT" Could be the Start of Something Big Now, with the growing use of building networks and the convergence of building controls and IT networks, it is becoming far easier to connect building occupants to the building control system by employing a simple "comfort and lighting" icon on each occupant's PC. Web-Based Automation Access to real-time information anywhere, anytime through an Internet-enabled automation system is the real value of this technology. A "Black Box" ...what Building Automation needs! Web-Based Control Systems - Doing more with more More access, more flexibility, more interoperability, wider area integration, but not more cost. Web Based Facilities Operations Guide Doing more with less by using Web-based anywhere information to amplify your existing building operational resources. Building Systems Commissioning: Let Technology do the Heavy Lifting Having the control network installed early in the construction phase allows the building automation system to do as much of the heavy lifting as possible including centralized data collection, analysis and reporting. Tools for Commissioning and Building Tune Ups The importance of building commissioning and tune-ups has recently taken center stage.